► Block the damaging UV rays with the Zone Tech Nylon Windshield Magic Sunshade, your affordable and convenient solution in keeping the sun’s rays from penetrating your car and keeping your car’s interior cool even in the blistering summer weathers. By purchasing this convenient sun shield you can ride your car more comfortably. ► The Zone Tech nylon sun shade is constructed out of premium quality nylon material to ensure maximum strength and durability for long lasting usage. Even intense summer weathers won’t affect these shades. They won’t fray around the edges or fade in color. The Zone Tech nylon sun shade features a patented Magic Shade two-panel design that protects the interior of your car by blocking damaging UV rays. The sun shades are contemporary and elegant shades that pop open instantly and fold down easily to 1/10th original size for compact storage. 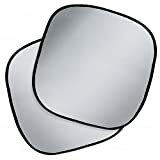 ► The Zone Tech silver foldable sun shade is easy to install. The sun shades can be used horizontally or vertically to fit a wide variety of vehicles. The Zone Tech nylon sun shade can be stored easily and neatly. Just collapse the sun shade by taking both on top of each other and then with your wrist grabbing it on opposite sides you twist in opposite directions and it magically just collapses into the little circles. ► SUN PROTECTION – Please measure before ordering The Zone Tech nylon sun shade is an affordable and convenient solution in keeping the sun’s rays from penetrating your car and keeping your car’s interior cool even in the blistering summer weathers. ► SMART DESIGN – The Zone Tech nylon sun shade features a patented Magic Shade two-panel design that protects the interior of your car by blocking damaging UV rays. The sun shades are contemporary and elegant shades that pop open instantly and fold down easily to 1/10th original size for compact storage. ► PREMIUM QUALITY – The Zone Tech nylon sun shade is constructed out of premium quality nylon material to ensure maximum strength and durability for long lasting usage. Even intense summer weathers won’t affect these shades. They won’t fray around the edges or fade in color. ► EASY TO STORE – The Zone Tech nylon sun shade can be stored easily and neatly. Just collapse the sun shade by taking both on top of each other and then with your wrist grabbing it on opposite sides you twist in opposite directions and it magically just collapses into the little circles. ► EASY TO INSTALL – The Zone Tech silver foldable sun shade is easy to install. The sun shades can be used horizontally or vertically to fit a wide variety of vehicles.
? Block the damaging UV rays with the Zone Tech Nylon Windshield Magic Sunshade, your affordable and convenient solution in keeping the sun’s rays from penetrating your car and keeping your car’s interior cool even in the blistering summer weathers. By purchasing this convenient sun shield you can ride your car more comfortably.
? The Zone Tech nylon sun shade is constructed out of premium quality nylon material to ensure maximum strength and durability for long lasting usage. Even intense summer weathers won’t affect these shades. They won’t fray around the edges or fade in color. The Zone Tech nylon sun shade features a patented Magic Shade two-panel design that protects the interior of your car by blocking damaging UV rays. The sun shades are contemporary and elegant shades that pop open instantly and fold down easily to 1/10th original size for compact storage.
? The Zone Tech silver foldable sun shade is easy to install. The sun shades can be used horizontally or vertically to fit a wide variety of vehicles. The Zone Tech nylon sun shade can be stored easily and neatly. Just collapse the sun shade by taking both on top of each other and then with your wrist grabbing it on opposite sides you twist in opposite directions and it magically just collapses into the little circles.